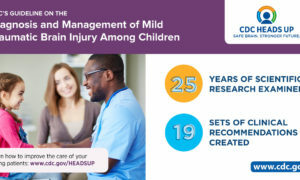 The Centers for Disease Control and Prevention (CDC) released a new Pediatric Mild Traumatic Brain Injury (mTBI) guideline. This guideline is based on the most comprehensive review of the science on pediatric mTBI (most commonly referred to as concussion) diagnosis and management to date. This guideline was published in the Journal of the American Medical Association (JAMA) Pediatrics and includes 19 sets of clinical recommendations that are applicable to health care providers who care for patients with concussions in all settings. Do not routinely image pediatric patients to diagnose. Assess for risk factors for prolonged recovery, including: a history of mTBI or other brain injury, severe symptom presentation immediately after the injury, and personal characteristics and family history (such as learning difficulties and family and social stressors). Counsel patients to return gradually to non-sports activities after no more than 2–3 days of rest. A letter to schools to be filled in by health care providers. These tools and additional information are available for download.